I used to be a really picky eater. Like really, really picky. As in, I only ate maybe five different foods and just the thought of trying new things would send me into a near panic attack. It wasn't something I was proud of, and I would try to hard to hide it from everyone I could. I'd feign stomachaches, eat before going somewhere, and spit food into napkins to try and hide my picky-ness from the world. When you're a small child learning to eat going from squished up baby food to all the textures and tastes of real food is pretty difficult. And I decided I wanted nothing of this. My parents gave in rather than forcing me to eat the salads and meats that were being made for dinner, and often just made me my own meal. That meant that I never learned how to eat other foods, my tongue didn't like these strange textures and I would seize up the second anything that wasn't mac-n-cheese, pizza, or a grilled cheese came near my mouth. In Japan, you cannot be that picky. In Japan, if you are that picky you will starve. Nearly all socialization done in Japan includes food. 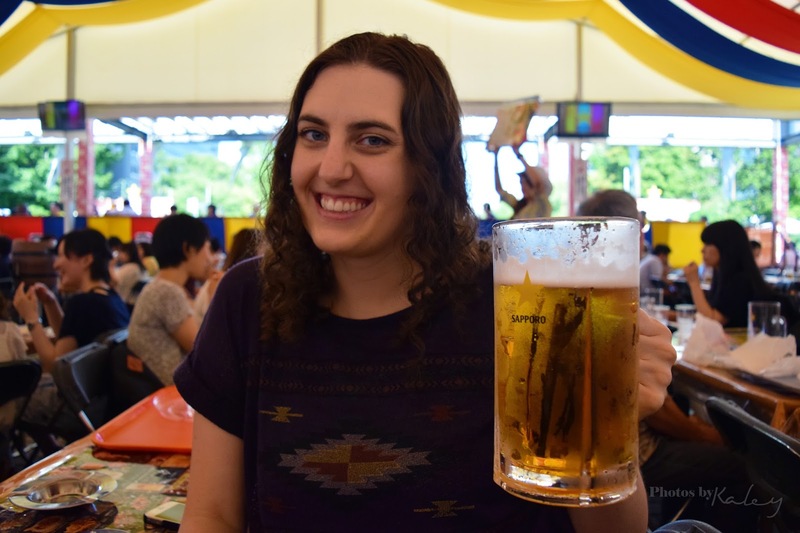 There was no way I could hide being picky in Japan. So, I decided I didn't want to. 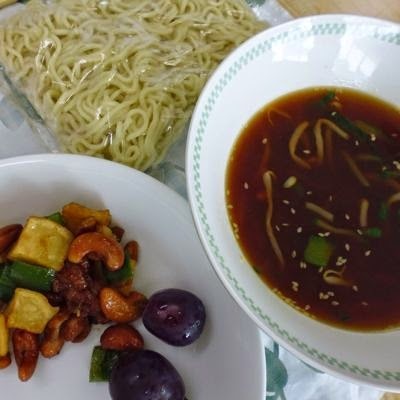 In the year leading up to moving to Japan I tried my best to do some work on my eating capable food repertoire. My lowest point was when I ended up crying in a supermarket whilst an ex-boyfriend was picking out a lovely dinner to have with his family and I couldn't imagine being able to eat any of it. The sheer ridiculousness of the situation fueled me with this fire that I. Must. Change. So I pushed myself really, really hard and tried my best to change my mindset. And that's when things began to change. It was a slow change, but eventually I began to eat more things. Most importantly, rice. As someone who was planning to live in Japan I couldn't not eat rice. Japan's school lunch is what helped me the most. I eat it every day. I could bring my own lunch, it was an option, but I didn't want to do it. I didn't want to be even more different. 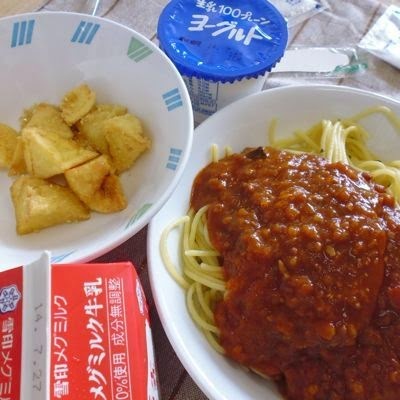 As part of my preparations for moving overseas I researched what Japan's school lunch would be and it scared me, it scared me good. Whole fish, tiny little fish, quail eggs, squid, natto, loads of mushrooms, shrimp, and even whale. I sat there staring at the pictures scared. I was going to starve, my schools were going to hate me. I should just bring my lunch. But I didn't, and as I began teaching in Japan I began the very slow (and hungry) process of teaching myself to eat new things. The first few months I lived in Japan I barely ate anything. I'd eat the rice, drink soup broth, try a vegetable here and there. Slowly, though, my stomach began to win out over my brain and I would eat things. I ate fish for the first time, and while I don't really enjoy the taste of most fish (and really almost all of seafood for that matter) I can eat it. I began to eat the salads that were given. And, most importantly, fruit. I could eat fruit. I am from Florida, I grew up with an orange tree in my front yard and a grapefruit tree and my back and I never once ate them. To me, eating an orange was the holy grail. It was everything I hated. Small, little things that break apart in your mouth, squishy, chewy, and just all-around gag inducing. If I could eat an orange I had finally conquered my texture issues. Just today I picked up a second mikan and ate it happily. I still have my issues, if I am having anxiety problems my ability to eat reverts back quite a bit. If I'm sick I can't really handle the different textures. And there are still some things I just won’t. Shishamo (whole fish), most mushrooms, quail eggs, shirasu (small little sardines), asari (manila clams), squid, natto (just google it), etc. But they are more of a taste issue than a "I want to eat this but can't" issue. And because I know you're all curious, here are some images of school lunches that my schools have served, just so you get an idea of what it is like. I cannot fathom most American children eating half of this stuff. 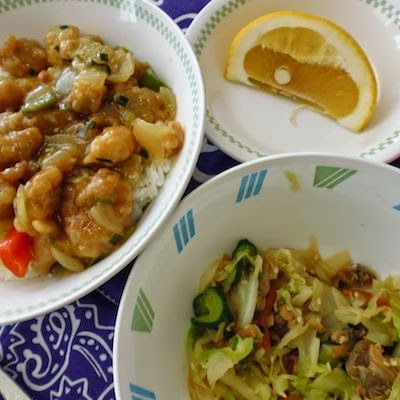 Grapefruit, chicken stir-fry over rice, a salad with manila clams in it. Italian soup, fried sugar bread, hasukappu (blueberry honeysuckle) jello, spinach salad. 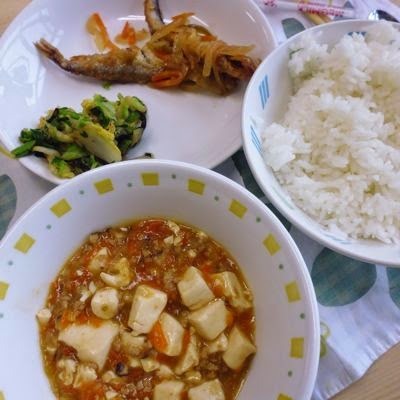 Shishamo (whole fish), tofu in a spicy sauce, rice, spinach and cabbage salad. 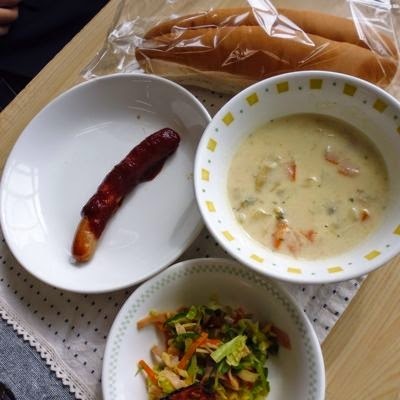 Clam chowder, pumpkin salad, hotdog in chili sauce with bun. 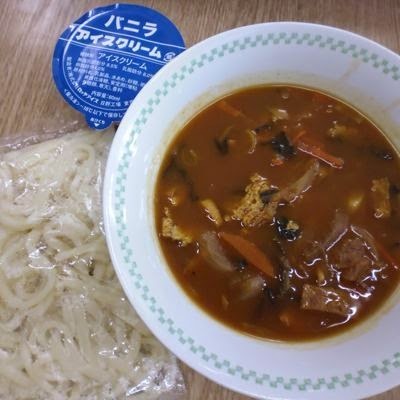 Curry udon with ice cream. One of my favorite lunches! 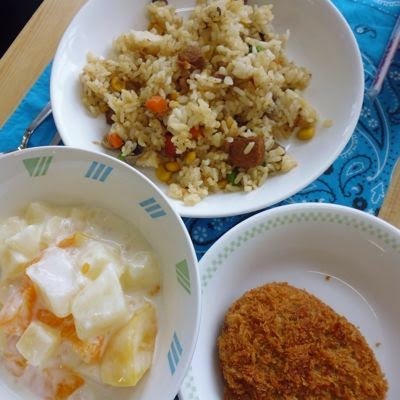 Pork fried rice, potato and beef croquette, yogurt and fruit salad. 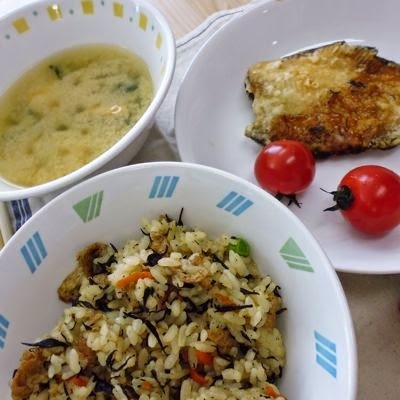 Hijiki rice (a seaweed), baby tomatoes, flounder, miso soup. 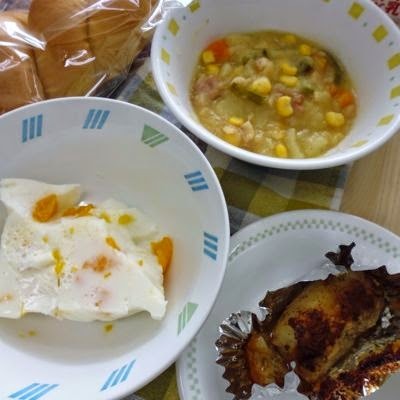 Bread, potato and bacon soup, white fish cooked in mayonnaise, milk jelly with fruit. Kaley, what an interesting post! The feeding difficulties you are describing are typical of sensory processing challenges. I have worked with children with similar feeding difficulties. I don't know if you are familiar with sensory integration, but you might enjoy reading about it. Congratulations in working so hard to adapt to a different culture! 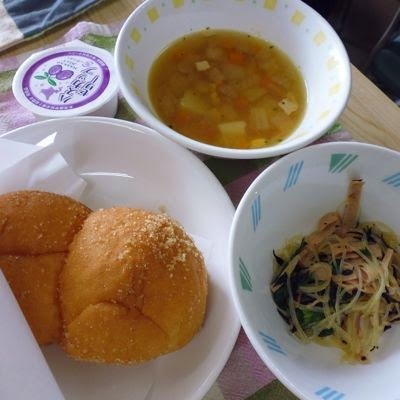 I really enjoyed the pictures of Japanese school lunches. When I worked in schools in the US, the meals served in the cafeteria were barely recognizable as food. It's really cool, that kids (and adults) in Japan eat this way. Thanks for sharing!